If you ever walk down Carroll Street between Columbia and Van Brunt, you may have noticed a tiny espresso bar called Kings Coffee. Co-owned by brothers Dominic and John, Kings Coffee sells beans and coffee that they will lovingly brew for you have a few minutes to linger. We asked them to answer our Five Questions for a Local Business. 1. How did Kings Coffee come to be in the Columbia Waterfront District? My Great Grandfather, John Vitale, was an artist who immigrated to the United States from Napoli. He opened his photo studio on the 2nd floor of 221 Columbia Street and settled his family into the 3rd floor. Thus, Great Grandpa John established my family's roots on the Waterfront. As my brother John and I set out to find a home for Kings Coffee, fate steered us from other neighborhoods and led us back to where Great Grandpa John had his start. 2. What should we know about your coffee? Will you be selling beans as well as cups of coffee? My brother and I spent two years apprenticing under a Master Italian Roaster in Bensonhurst whom everyone affectionately calls Mister Joe. After 50 years in the business, Mister Joe decided it was time to retire. And so, he taught John and I his traditions and trusted us to continue his legacy. Mister Joe has an incredible pallet and during his career he perfected two blends of coffee. These two blends of coffee, Mister Joe's Espresso and Mister Joe's Americano, as well as, a single origin Decaffeinato, can be purchased at Kings Coffee. Kings Coffee also has a small Espresso Bar where you can purchase cups of coffee, mostly in the Italian style with a notable exception, the Breükelen Dutch. A nod to Brooklyn's roots and brewed with the first CoffeeGa Ridge 3.2 in the country, the Dutch Cold Brew method produces one of the finest cups, both smooth and flavorful with noticeably less acidity. You can purchase flasks of the Breükelen Dutch concentrate so you can take the experience with you on life's adventures. Better yet, come back with your stories and your bottle and we'll gladly refill it at a discounted rate. 3. What is your favorite spot in the Columbia Waterfront? We are lucky to have Chris and his team at Christopher Webb Films as our neighbors. Having creative minds gathering just down the block – or with us when they escape for coffee breaks – is infectious and inspiring. 4. What's your favorite meal in the Columbia Waterfront? Less of a meal and more of a snack. I have an awful sweet tooth and a wonderful chocolate factory to cater to it. The chocolate from Cacao Prieto is decadent and pairs wonderfully with our Breükelen Dutch, an indulgence you can only experience on the Waterfront. 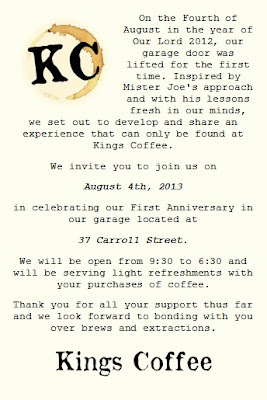 We will be celebrating our One Year Anniversary on August 4th. We would love to see you and your readers there. Kings Coffee is offering Word on Columbia Street readers $1 off your next purchase at Kings Coffee when you mention The Word on Columbia Street, good until July 31st, 2013. Conditions apply. Limited one per customer. Rooftop Films at the Waterfront Museum!